The Tonkinese is a pleasing feline which is attracting attention for its appealing physical appearance and engaging personality. 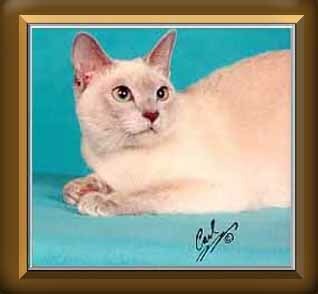 This breed blends the distinctive characteristics of its Burmese and Siamese relatives, resulting in a cat with its own unique identity. The Tonkinese have distinctive body colors with darker color coordinated points. The natural mink has dark brown points with a medium brown body. The champagne mink has medium brown points and buff cream body. The blue mink has slate blue (grey) points and blue grey body often with fawn over tones. The platinum mink has pewter-grey points with a pale silvery-grey body with an ivory cast. Complimenting the coat colors are dazzling aqua eyes in all ranges of blue and green. Many Tonkinese are born with solid or pointed color coat patterns, similar to the Burmese and Siamese, with eye color ranging from blue, to green to gold. All Tonkinese, no matter the color, make wonderful pets. The ideal Tonkinese is intermediate in type, being neither cobby nor svelte. They have good muscular development and although sleek, are surpriseingly heavy for their appearance. The best part of the Tonkinese is their PERSONALITY. They are a people oriented cat, warm, loving and mischievous. Active and athletic, as well as shoulder riders, you will frequently find yourself in a game of fetch with them. Tonks do talk but not excessively and adjust well to other animals in the household. We have been raising Tonks exclusively since 1986. They are home raised from birth and are fabulous cats and make wonderful companions. Copyright 1996,2000 Photographs are the copyrighted property of the photographer and may not be printed, downloaded, copied or reproduced in any form without the express permission of the photographer. The TBA logo background is the property of this Webmaster. Any member of TBA may use it freely. Please email the site owner. Catdancing Cattery with your URL before using it.